An x-ray examination of the breast, advocated for women over 35. It is used to detect and diagnose breast disease, and can detect a tumor that is not yet large enough to be felt. It doesn’t prove that cancer is present, but can raise suspicions that may require further investigation. Regular mammograms can significantly lower your risk of breast cancer. 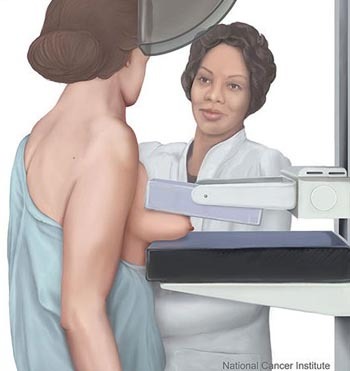 They reveal small cancerous lesions in the breast up to two years before they can be detected by self-examination. Schedule your appointment for one week after your period. Avoid talcum powder, perfume or body lotion on the day. Wear a shirt you can easily remove.